(a) Position the front shock absorber assembly level with the piston rod fully extended. 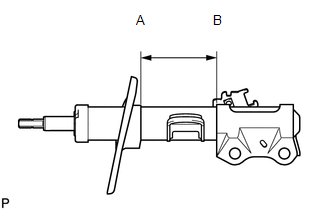 Using a drill, make a hole in the cylinder between A and B as shown in the illustration to discharge the gas inside. Be careful when drilling because shards of metal may fly about, so always use the proper safety equipment.